The largest and most obvious change we made this month was the rollout of Kentik Detect v3.1, which introduces our new Library section of the portal. If you’ve logged in recently you probably noticed the announcement in a popup that appears at login. The Library gives you a single page from which to create, view, modify, and manage views of your network traffic data. 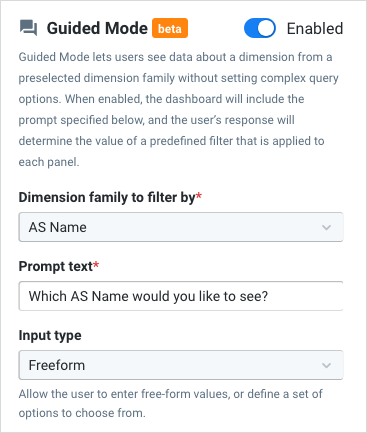 It’s a big step forward in our effort to streamline your workflow when using the portal, and it will enable us to rapidly develop a rich array of preset views for specific use cases. Users can now make the Library their default landing page via the Default Settings pane of the User Profile (accessed via the drop-down menu at the far right of the main portal navbar). Persistent access: The Library tab is always available for direct access to dashboards and saved views. The list includes views that you’ve designated as favorites and also those that you’ve recently viewed. 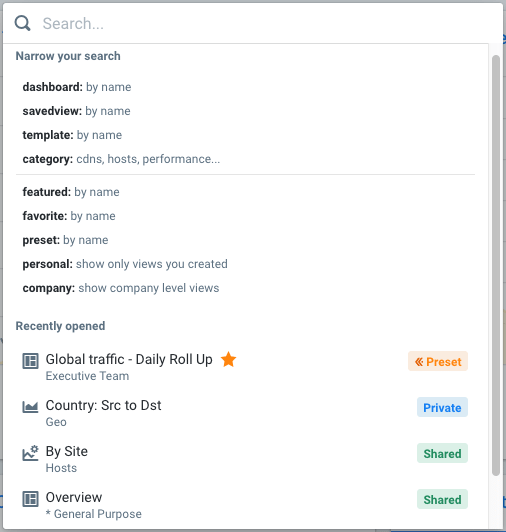 Ubiquitous search: A search popup (shown at right) that launches from the main navbar means that you can quickly find views wherever you are in the portal. Content organization: Views in the Library can be assigned to categories and are grouped into buckets (personal, company-shared, and Kentik presets). Content discovery: The Library landing page gives us the ability to promote new and featured views, organized by task-specific categories or consumer teams. Adding dimensions that enable characterization of network traffic, e.g. Interface Classifiers and Network Classifiers. Upping the portal’s visualization game with new view types (Gauge, Geo HeatMap) and making data more visually useful with Bracketing (application of colors based on value range). Bringing interactivity to dashboards via guided-mode dashboards and dashboard navigation (drill down to deeper views). Keyboard shortcuts, enabling greater efficiency for commonly performed tasks, have now come to the Kentik Detect portal. How do you find the shortcut for a given task? Press [SHIFT]+[?] on your keyboard to pop up the shortcuts help menu. 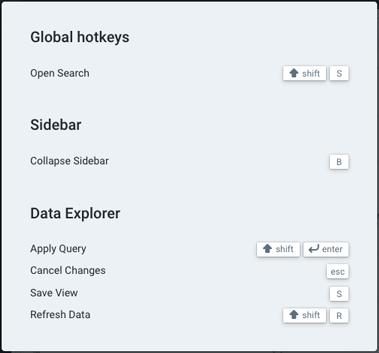 As shown in the screenshot at right, the popup is context-sensitive and will display both global shortcuts and those that are specific to an individual page (in this case Data Explorer). –status-port gives you the ability to check the status of the agent by defining the port to listen on. –status-host enables access beyond the localhost IP address (127.0.0.1). Once the new parameters are configured, you can point your browser to http://host:port/v1/status to get a JSON output of the status. For more information on installing and configuring kprobe, check the Knowledge Base (KB) article on Host Configuration. 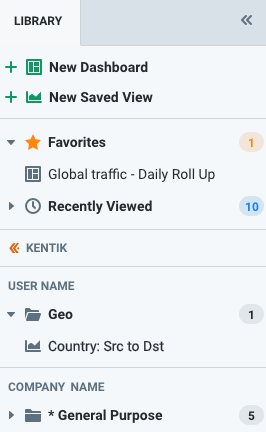 In last month’s product update we introduced a new analytics view called Raw Flow, which enables you to directly examine the flow data stored in Kentik Data Engine (KDE), the back end datastore used by Kentik Detect. We’ve further improved this functionality by adding a filter box and also the option to export the results in CSV format. With the filter box, filtering is now as easy as entering a string. As the user types, the page refreshes with matching results. Once you’re happy with the results, click the blue Export CSV button to export the flow records. For more about this feature see our KB article on Raw Flow. Those readers who’ve used our alerting system know that it’s based on alert policies that are each made up of one or more thresholds that enter alarm state when triggered by user-defined conditions. Alarms generate notifications (email, Slack, PagerDuty, etc.) but they can also automatically initiate mitigation. With our latest iteration you can now assign more than one mitigation per threshold. You can now use a single policy to configure all of the desired mitigation methods/platforms with which you’d like to respond to a given set of conditions, which is much more scalable than cloning a given policy for each of your appliances so that they can all trigger at the same time for a given condition. Users with mitigation appliances at multiple sites now have the ability to trigger them all at the same time. 1. De-preference or stop-announcing a BGP route on Location #1 by injecting a route whose community has been predefined as a flag for these actions. 2. Announce a broader routing table entry, less-specific than /24 (thus forcing acceptance by Internet peers), for Location #2. 3. Trigger a 3rd-party mitigation method — e.g. A10 or Radware — on Location #2 to announce more specific prefixes for internal re-direction to a scrubbing center. To add a second mitigation to an existing policy, head over to Alerting » Policies and click on the name of the policy. In the Edit Policy dialog click the Alert Thresholds tab and scroll down to the Mitigations section. In the drop-down Add Mitigation menu, select the appropriate mitigation platform and click the Add Mitigation button. For more information about using mitigation, check out our KB article on Alert Mitigation. For a while now the portal has included in-session popup notifications about service issues (red background) and when updated versions are available (blue background). Most users find this information helpful, but in some circumstances — e.g. running Kentik Detect on a large monitor in a Network Operations Center (NOC) — users may find the popups to be a distraction. We’ve addressed this by tying notification behavior to the existing “Product Updates” and “Service Updates” settings in the User Profile (accessed via the drop-down menu at the far right of the main portal navbar). Turning off Product Updates will suppress in-session version banners, and turning off Service Updates will suppress in-session popups for system messages (outages, etc). These system messages will still show at login, but new ones will not be shown during an active session. For more information on these notification settings, check out the User Profile topic in our KB. One of Kentik Detect’s most powerful features is the ability to add additional context to netflow data using flow tags or custom dimensions (see our Flow Tags and Custom Dimensions KB articles). 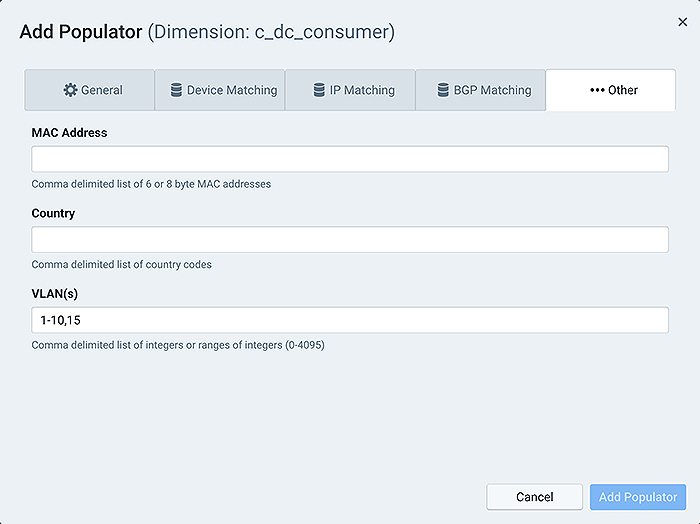 We’ve now extended this feature by enabling tags and custom dimension populators to match on the VLAN ID of flow records. The value for VLAN ID accepts comma-separated values between 0 and 4095 (inclusive), as well as integer ranges, all of which can be intermingled in the same list.